As if the post-storm rainbow and beautiful weather weren't enough, singer-songwriter Josh Ritter gave the Sunday night Taste of Randolph Street crowd a lot to be happy about. Not only did Ritter and his band deliver a tight, rocking set, the singer seemed so genuinely thrilled to be there that it would have been difficult not to join in on his glee. In fact, Ritter, who headlined the final night of the West Loop's annual three day street festival, wore a grin during nearly every song in his 75 minute set. 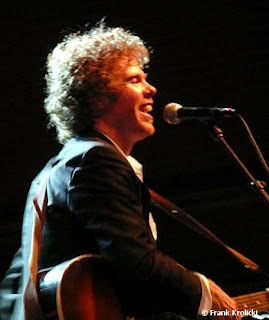 His enthusiasm best shone through in the repertoire's punchier numbers, including seven songs from his critically acclaimed 2007 LP, "The Historical Conquests of Josh Ritter." Ritter and company opened the set with the first two tracks from "Conquests" in reversed order. The moody "Mind's Eye," reminiscent of Spoon, paved the way for a revved-up version of "To the Dogs or Whoever," one of the highlights of the night. Ritter dispersed faithful renditions of other "Conquests" standouts throughout the set, and saved perhaps the best part for the second half, which featured a one-two punch of the infectious, radio-ready "Right Moves" and the sing-along rocker "Real Long Distance." Although "Conquests" is his most recent and well-known work, Ritter didn't ignore earlier material. "Me & Jiggs," "Other Side" and "Harrisburg" made sure 2001's "Golden Age of Radio" was accounted for, while "Wolves," "Girl in the War" and "Good Man" represented 2006's more subdued, serious "The Animal Years." Ritter closed the show with the Dylan-esque "Kathleen" from is 2003 disc "Hello Starling." Somewhere in the middle of it all he even managed to throw in a John Prine cover, "Storm Windows." While Ritter's music is often described as "folk-rock," his Taste of Randolph set emphasized the "rock," with only an occasional quieter moment. Whether he was jumping around the stage or making humorous gestures in the middle of songs, Ritter made it clear that he's more than just a musician - he's a full-fledged entertainer, and his likable performance proved an ideal way to usher out this year's festival.